As a part of the Bihar Government’s seven resolves, the Students Credit Card scheme has been launched and has been active since October 2, 2016. This scheme has been designed in order to focus on the needs of the students relating to higher studies. Along with this scheme the Bihar government has launched many other schemes which would aim at improving the socio-economic condition of the state. The scheme was launched during the function arranged on the occasion of Gandhi Jayanti in 2016. In Bihar one of the common problem that prevails is that students do not opt for higher education. The maximum qualification that they go for is class 12. Now there are a lot of reasons behind this. One being the expense of the courses and the then being the higher interest rates on the available education loans. So the main objective of the scheme would be provide financial support to the students of Bihar who and to peruse higher education after passing class 12 exams. With the help of this scheme the government of Bihar would try and encourage the students of the state to at least take interest free loans offered under this scheme and pursue their higher education. This would lead to the increase in the chance of their employment opportunities. The government Bihar has understood the disadvantages of the existing education loans and so has come up with the Students Credit Card scheme that would be the most affordable education loan scheme for the students. This scheme would be providing education loan to the students of the state who have passed class 12 exams. A loan amount of up to 4 lakhs will be given to the students for buying books, paying semester or monthly course fees, and for buying any other education equipment. This is an interest-free loan. The loan will be given for specific technical courses or proper educational course. This would include engineering, CA, CFA, Management, Medical, Education, etc. To avail this scheme the student has to peruse the course from a reputed and authorized college or institute. There will no discrimination done for providing loans on the basis of caste or religion. The loan will be provided for any recognized course in any authorized organization of the country. 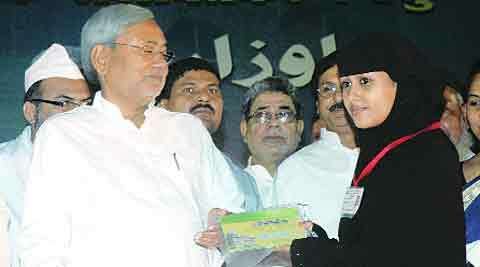 The scheme is only open for the students who are residents of Bihar State. One has to provide proper proof for availing this scheme. Students from all the districts of Bihar can avail this scheme. Aadhaar card would be an important part of this scheme. The students applying for this scheme will have to provide their Aadhaar card number; this will not just make the system more transparent but al make it easy to transfer funds. The loan period is of 4 years which means that after four years, from the day loan has been taken, the student has to start paying back the loan. In the state number of counters are being set for the collection of application form. Once the verification is done the students will be sent their credit card. Under this scheme the State Government will be the guarantor of the 25% of the loan amount and the parents or the guardians of the students have to guarantee for the rest of the amount. Only students for Bihar will be applicable for this scheme, respective applicant must have valid address proof for claiming as resident of the state Bihar. The maximum age limit of the scheme is 25 years. So the students who are applying for this scheme should not be above 25 years. The students who already have an education loans and any availed any other financial aids from any of the existing schemes of state means will not be applicable for this availing this loan. The student who willing to avail financial aids under this Bihar state government scheme of Students Credit card Scheme has to be a minimum of metric pass to apply for this loan. The course should be either technical or educational this may include BSc, BCom, BA, B.Tech, MBBS, etc. But the student has to pursue the course from a reputed college or institution only. Any random additional center will not be accepted. In order to apply for this scheme the students of Bihar just need to visit the official website educationbihar.gov.in of the scheme or even download the mobile app of the scheme. Also the detailed notification can be viewed at PRD Bihar Government website. The student will then have to enter his or her mobile number on the space given on the website or mobile app. A one time password will be sent to the mobile number, which has to be entered in the mobile app or the website. Once this is done a form will appear on the screen that has to be filled. Then one has to press the ‘submit’ option to apply for the scheme. The students will then receive a unique identification number that has to saved and kept for further use. Also a PDF copy of the application form will be sent to the given e-mail id along with the list of documents that would be required. Now with this copy of application form and the copy of the required documents the student will have to go to the application counter that is close by and submit all. The date in which the student has to visit the counter will be sent to the mobile number that is registered. Documents required for application are- fee details of the course, admission certificate, class 10 or 12 mark sheet, address proof, family income certificate copy, bank account statement of parents of the last six months, and Aadhaar card number of the student. The scheme comes as a great benefit for all the students of the state who are unable to peruse their higher education due to the lack of money or the high interest rate of the available educational loans. The best part about the loan is that it is interest free and the application process and the loan approval process is not complicated. It is estimated that around 5 Lakh students from the Bihar state are able to get financial aid of Rs. 4 lakh from this newly launched Student Credit Card Scheme. Below listed number of students are availed financial aids under this state government student credit card scheme. During the academic year of 2016 to 2017, under this scheme around 5, 00,000 students from the Bihar state is accepted at the eligible students to avail financial loans from the state government. Meanwhile, target has been fixed by the government officials up to the academic year of 2020 to 2021 by increasing the current students numbers by increasing 1 lakh for every academic year, by doing so, by the end of the academic year 2020 to 2021 around 9, 00,000 lakh students would be availed loans under this scheme. Experts all over the country appraises the initiatives taken by the chief minister of Bihar Nitish Kumar on promoting students from poor families or from financially lower families to avail higher studies under the government funding through this Students Credit Card Scheme. However, they also warned as loan re-payment should be done in proper manner in order to avoid any financial crisis in the state.